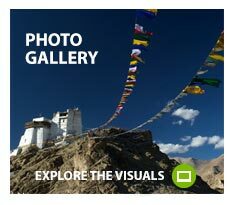 Ladakh is sandwiched between two mighty mountain ranges of the planet the Himalayan in the South and the Karakoram in the North; one sees no horizon but just soaring peaks all over, thus we have innumerable options of climbing in Ladakh and the most popular are Stok Kangri, Kang Yatse, Mentok Kangri, Chamsher & Lingser Kangri. Most of these peaks you requires no special mountaineering skills. 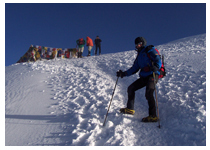 However you need to be a good trekker and must be fully acclimatized for these climbs. 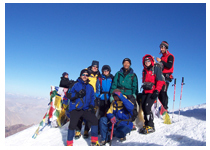 Some of the peaks give you a real opportunity to climb an above 6000m mountain within a week or more, which is not possible in any other part of the world. Stok Kangri is one of the most beautiful peaks in Ladakh. 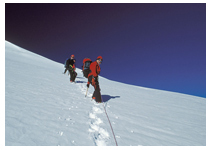 The climb is technically not difficult, and requires no special mountaineering skills. It gives you a real opportunity to climb a 6150m mountain in less than a week, which is not possible in any other part of the world. 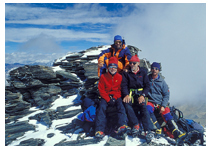 The summit presents one of the most spectacular views of the Saser peak in the Karakoram Range, where the K2 lies. 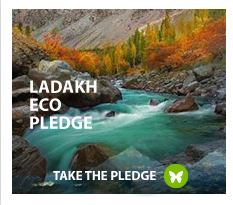 Kang Yatse Lies south east of Leh and its situated in Markha Valley on the top of Nimaling Plateau. This beautiful peak is a desire for all the trekkers doing the Markha Valley, as they are always having a glimpse of this outstanding peak while trekking there. Actually there are two peaks one is easy and non-technical 6200mts high, and the other one is quit technical 6400mts. high. Though there are many options for this summit, but the best way is to combine with the Markha Valley. Mentok is Kangri is one the most fascinating peaks in Ladakh. Situated near Kprzok and western side of the famous Tsomoriri Lake, this high and arid landscape has captured the imagination of travelers since its opening. The expedition travels through the settlements of Changpa Nomads. 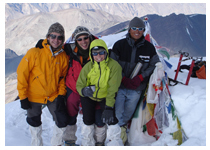 In this Trek/climb you will explore the inhabited nomadic herders and by rare animals such as wolf and kiang Tibetan Argali Blue sheeps and many rare species of wild birds. After a week of inspirational trekking, we reach the high passes that provide our first views of Lungser Kangri (6666m) and its near neighbour, Chamser Kangri (6620m) - the highest of a ridge of snow-capped peaks on the east side of Tso Moriri. From a basecamp above the lake, the peak is climbed by way of a high camp and a long summit day. 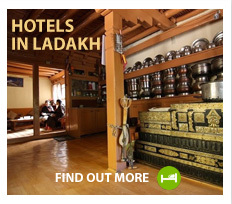 Not so technical, from the top of Lungser you can have scintillating views of the Western Tibet and Changthang plateau.